Check out our 15-second preview of the 2014 Arts on Fire Fest, airing on WNEP! There are still openings for high school students to learn how to pour iron via Keystone College and Keystone Iron Works. Pours will take place during the Arts on Fire Festival! See the flyer for details. An event such as Arts on Fire cannot happen without lots of dedicated event partners. Our most sincere thanks to everyone who helped make the fourth annual Arts on Fire Festival a great success! 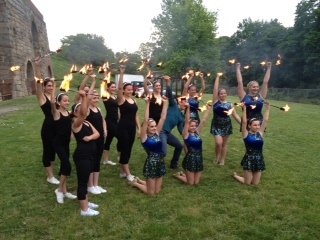 After months of planning, the fourth annual Arts on Fire Festival was a great success! We cannot thank our event sponsors enough for their help with our event. Leckey Live tours Arts on Fire! Morning television viewers across Northeast PA got a sneak peek of the festivities set for this year’s Arts on Fire Festival when Ryan Leckey of WNEP-TV toured the festival site. Beginning at 4:30 a.m., Leckey and his high-energy style was on display from the setting of the Historic Iron Furnaces in Scranton, bringing demonstrations from several of the participating artists into thousands of homes across the region. Demonstrating their work was blacksmith Dan Perry, RAKU artist Jared Jaffe, twirlers, and the Mid Valley High School Steel Drum Band. Check out the segments via this link! The historic Iron Furnaces in Scranton are a historical treasure, one that provides a truly unique setting for Arts on Fire! Before the Arts on Fire Festival kicks off, get a behind-the-scenes look at the furnaces by tuning in to Electric City Television, better known as ECTV. The walk-through (11 minutes in length) airs at various times on ECTV, so be sure to check the online broadcast schedule in the attached link for the next show time.